FXCM Rallies 42% Despite Dow Jones' 367 Point Drop – Is Hotspot Helping? 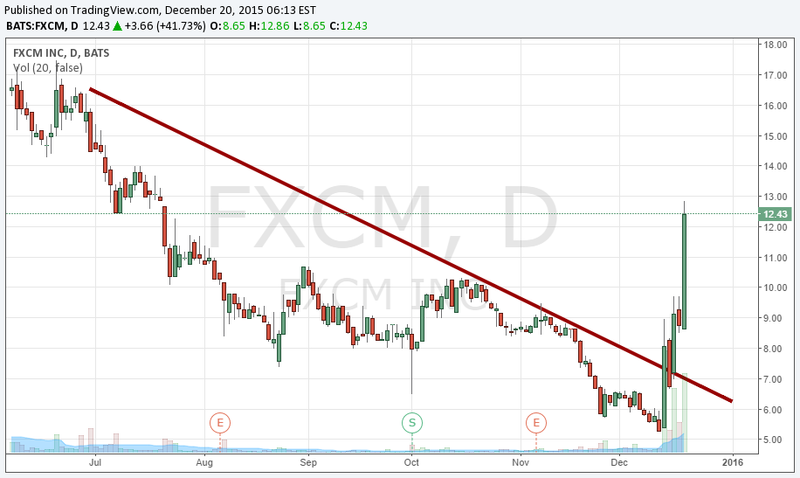 FXCM ended a strong week by continuing its rally on Friday. This article examines the factors that may have helped. Shares of embattled broker FXCM, finally experienced some love from investors after months of negative sentiment. The positive move began last Monday as shares rose over 50% to close at $8.08. The impetus was a statement from the broker that FXCM and Leucadia, which had provided $300 million in emergency funding in January, “remain committed to restructuring their existing Letter Agreement in a manner that is consistent with a sustainable long-term and value-enhancing strategy for both companies”. In addition, the statement revealed the intentions of FXCM’s senior management to participate in stock purchases, along with the company’s own stock repurchase program. Putting their money where their mouth is, SEC statements showed that the management, headed by CEO and CFO Drew Niv and Robert Lande respectively, did in fact engage in stock purchases. This news led FXCM shares higher again on Wednesday, with the stock closing at $9.16 after briefly appearing above $10.00 for the first time since October. The week culminated in the largest dollar move on Friday as shares rallied $3.66, or 42% to close the week at $12.43. Unlike the week’s previous moves, the rally occurred without any specific company announcements. In addition, the performance was in contrast to the overall market, which saw the Dow Jones shed 367 points (2.1%). In order to explain what triggered Friday’s move, we can look to two possible reasons: the day’s option expiries, and positive technical for the stock. In terms of the latter, the stock cleared several resistance levels such as the $8.72 and $10 mark that were viewed as key points by retail traders. Having earlier in the week popped out of a negative downtrend, the continued move higher is believed to have gained momentum, causing additional systems to become bullish on FXCM. Beyond the technical momentum, Friday also represented Quadruple Witching for the stock markets. Occurring on the third Friday of March, June, September and December, these days see stock options, stock futures, index options and index futures all expire on the same day. The result is historically higher volatilities caused by the intra-day moves of traders adjusting portfolios to reflect expirations. In terms of FXCM, the week’s move may have caught bearish traders who had sold calls or shorted the stock and led them to aggressively buy shares to cover option or margin obligations. In this regard, FXCM’s stock did see a spike in volumes, with over 2 million shares trading compared to their three month average of just below 200,000. One fundamental driver that could be in play and may lead to value players becoming interested in FXCM was news that BATS Global Markets has filed intentions to go public. With their $365 million acquisition of Hotspot FX from KCG earlier in the year, the IPO filing provided more clarity on that deal. With FXCM putting its 35% stake of FastMatch, a Hotspot rival, on the market to cover a portion of its Leucadia debt, the BATS filing provides more clarity on valuations. The figures point to a rich valuation put on Hotspot’s business with much of the paid value based on the FX ECN’s relationships and potential growth when combined with BATS. For FXCM, the Hotspot deal can be used as a proxy to value FastMatch. Using similar valuations, FXCM’s stake is FastMatch in slated to be worth between $45-$55 million. Worth noting is that even after last week’s rally, the stock remains well below its post-SNB crisis level, let alone the $170 level it had traded around during the same period last year. However, the current momentum could see further gains thanks to improving fundamentals in the forex market. Following a dull November, volumes have finally picked up again during December, in what is typically a weaker month. Public figures of trading from both FastMatch and Hotspot reveal that both venues are on pace to report a strong month of trading. For Hotspot, at an average of just above $30 billion in daily volumes, December is on pace to be the best month since May. At FastMatch, the venue is currently averaging over $10 billion in daily volume for the first time this year, with an average of $11.8 billion. If the figure holds, it would be the best month since November 2014. For FXCM and other brokers, the volume increases taking place at publicly reporting venues bode well for their retail businesses. Due to a lack of clarity on the Fed’s coming actions, as well as whether the ECB would continue to be apply monetary stimulus policies, forex speculation among traders has declined. However, with the ECB continuing to cut rates, and the Fed raising them for the first time since 2006 and signalling for further hikes in 2016, there is a clearer picture for traders. As such, we could see renewed speculation among traders for carry trades and other currency rate arbitrage strategies as they become more comfortable with the near term direction of global interest rates. Beyond FXCM, one broker specifically worth watching is GAIN Capital. The firm issued poor retail results for November. These showed that despite a 50% increase in active OTC accounts following the closing of their acquisition of City Index, volumes were below the same period in 2014. November’s results followed similar weak numbers during October. However, a boost of volatility during December may be enough to trigger greater revenue capture for the overall Q4 quarter despite tepid volumes. So how much of the Leucadia loan has been paid off?